The Gayle Bradley Folder is one of a number of collaborations between Texan custom knifemaker Gayle Bradley and Colorado’s production giant Spyderco. Although it is recently discontinued and replaced by the Gayle Bradley 2, the original Gayle Bradley folder remains a favorite among Spyderco fans. After spending a little time with the knife, it’s not hard to see why. So why am I posting a review of a discontinued folder? Well, I’m planning to review the recently issued Gayle Bradley 2 but wanted readers to first appreciate why the original was so damn good. Plus, if you search hard enough you can still get your hands on the original Gayle Bradley and it’s reached near-legendary status in my book. So, why not. 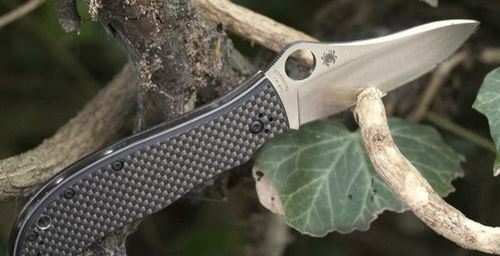 Rock solid yet elegant and swift...the Spyderco Gayle Bradley earns legendary status. A lot of knife designers these days are known for their distinctive “style” of knives, but not necessarily the performance of said designs. Gayle Bradley’s fixed blade designs have actually won competitive cutting contests, making his work more along the lines of Mors Kochanski (arguable the father of the modern bushcraft knife) or Jens Anso (renowned for his minimalist functional designs) than style-driven designers like Brian Tighe, Ken Onion, or Todd Begg. Perhaps the most controversial aspect of the GB, the blade is made from Crucible’s CPM-M4 steel, which is decidedly not stainless. CPM-M4 is a powdered metallurgy version of M4, a high carbon tool steel known for its remarkable impact resistance. Like most other steels that have been formed using the CPM technique, performance is enhanced in a blade application thanks to a much finer grain leading to a cleaner, more stable edge. Everyone has their preferences for blade shapes, but for me a drop point is the greatest balance between toughness and maneuverability of the tip in detail work – which is aided by the 50/50 (or rather 30/60) choil to choke up on. The choil itself isn’t particularly strongly defined, but it’s been said that the best knife designs let you pick where to place your hand rather than force the decision on you. It’s enough to aid in retention and confidence in your work but not enough to feel forced. In hand, the Bradley works remarkably well, with the step between the liners and scales providing a little more definition to your grip. The scales themselves are smooth polished stainless steel with no sharp edges at contact points, giving the knife a solid but comfortable feel in hand. The forward edge of the handle forms a shallow choil with the very end of the tang of the blade, but unlike models such as the Manix, it’s not really a forward-or-rearward grip choice due to the location of the ramp on the blade. As a whole, though, the Bradley Folder is a user-friendly knife in that it allows you freedom of how to position your hand versus forcing you into one or two positions. The angle of the blade relative to the handle itself is slightly downward, allowing the knife to naturally “pull” whatever material you’re working on into the blade itself – while it makes the blade look slightly off balance, in practice it makes the process of cutting much more natural, especially with fibrous materials like rope which require something of a sawing motion. As a final note on ergonomics, an interesting – and controversial – observation regarding the handle: there is no lock-release cutout for the nested liner lock, just a scalloped inner edge on the liner opposite the lock. Many users complain about the lock release being rough on their thumbs, and some have even taken to the show side of the handle with a Dremel tool and some high-grit sandpaper to open up a lock cutout. The whole idea behind the occluded lock is to prevent accident release while twisting (which can be an issue with a liner lock). I’ve found that if you use the relief on the inside of the liner and stick your thumb straight down then push over to the side you don’t chew your thumb up as much as if you try to just push straight over. I don’t like to overuse superlatives, but the lockup and action on the Gayle Bradley is perfect. And as a rule of thumb, I don’t especially like liner locks. First, deployment: the Gayle Bradley has a nice big “Spyderhole” opener, which after using various different mechanisms I’m convinced is the best mechanism for opening a knife. It allows you a variety of techniques from a slow and controlled roll open with a thumb, to the impress-people-on-Instagram flick open using your middle finger from the rear side of the knife. I’ll be totally honest in that that’s how I tend to open all my Spydercos, Gayle Bradley included. The Gayle Bradley is a perfect example of how to do a washer-pivot liner lock. It’s exactly right, with a fluid feel if you slowly roll it open and a smooth “smack” if you flick it open. As cool as titanium liners are, and the weight savings they impart (the Gayle Bradley 2, which has titanium liners, is 1.1oz with a similar overall length), there’s nothing quite as smooth as a steel lock on a steel blade. Many Ti framelocks add a stainless steel insert to circumvent this issue, which adds weight and complexity. Not necessary here, the stainless liner engages perfectly with the tang every time with approximately 95% engagement relative to the tang. With a liner lock, you have a three way balancing act: the trade-off between a smooth/fast action, a lack of horizontal blade play when open, and blade centering. The mark of a good knife is getting the first two right; a great knife gets all three right. This is even more complex with a liner lock than with, say, an Axis lock or a ball bearing lock because the lockbar puts lateral pressure on the blade when closed. I mess with almost every knife I ever get right out of the box to make it “right” but I didn’t (and still haven’t) touched the Bradley; centering is spot on with the hourglass shaped standoff, it opens with a satisfying “snick” and there is no blade play in the open position whatsoever. It’s been said that Spyderco’s knives produced in their Taichung Taiwan plant are their best quality products, and I tend to agree. Not that there’s anything inherently “wrong” with the US-made Spydercos, but there’s an extra degree of polish and perfection to this one. On an open construction knife, a slight machining imperfection will put the two halves of the knife off enough to feel or see with the naked eye, but everything lines up perfectly. There’s a stainless lanyard tube that runs through the scales between the last two body screws and sits completely flush with the outside edges of the scales. I don’t typically use a lanyard on my knives so I can’t comment on its function. The clip is a classic three-screw spoon style clip that’s painted black; a month’s wear has roughed up the edges a bit, and the knife could benefit (like many others) from a tougher coating on the clip like a DLC or parkerized finish – or a polished stainless clip, which would suit the polished liners and blade finish. It is four-position configurable (tip up/down left/right) but it came tip up right hand which is how I carry. The Spyderco spoon clip carries great here like it does in most other Spydercos, with strong retention but the curved leading and trailing edges aiding in smooth storing and removal from a pocket. I’m not sold on the merits of 3D-machined clips, and I don’t think they would suit the “classy but utilitarian” nature of this knife; and at 5+ ounces Spyderco’s wire clip wouldn’t do it any favors either. Where the Gayle Bradley shines is its cutting functions. The deep hollow ground blade presents a very thin, friction-free cutting edge that absolutely sings through cardboard, plastic, nylon straps, and the various other things I cut though at home or in the outdoors. There is no sharpening choil, which is a downside for touching up the blade but on the plus side it doesn’t get hung up in material as you’re maneuvering it. The forward finger choil and downward slant of the blade give you a lot of leverage on what you’re cutting, making tasks easier and affording greater control over the material. At the same time, the tip is thinned out on the top edge by a shallow swedge that gives you a fine piercing point. It’s really a joy to cut stuff with this knife; it makes remarkably quick work of blister packages, plastic bottles, cardboard lids, etc. Being a non-stainless steel, I haven’t attempted to use the GB for food prep, but I can say that CPM-M4 holds an edge considerably better than most high-end stainless steels. It’s up there with S35VN, S90V and dare I say S110V. Moreover, it’s easier to sharpen than those stainless wonder steels. Not that that’s a big worry: M4 is an incredibly hard steel, so you won’t be breaking out your stones frequently. A 3.5” hard-use folding knife describes a pretty large percentage of the market, so competitors are pretty broad. Staying in a similar price range (the Gayle Bradley retailed at $185 when it was in production), if you prefer flippers, the G10/Elmax Zero Tolerance 0562 is the pinnacle of Hinderer’s work, with a slick ball-bearing pivot at an even $200. There’s also the new Benchmade 551-1 full-size Griptilian at $178, with its grey G10, blue standoffs, and Crucible CPM-20CV steel (analogous to M390 or CTS-204p) with almost identical blade length, plus Benchmade’s famous Axis Lock. If you want to try something different (and who doesn’t?) and don’t mind resharpening 154CM, the Hogue EX-01 in 3.5” drop-point with G-Mascus handles presents a unique USA-built alternative with a slick-as-hydraulic-fluid button lock for $186. Of course, the major comparison is the revised Gayle Bradley 2, which is significantly cheaper ($137) and has titanium liners making it a full ounce lighter. Personally, I think the original Gayle Bradley Folder has a rock-solid bank vault feel you don’t get from titanium liners, and less generic ergonomics that lend it a notable personality that seems to be lacking in the GB2. Your mileage may vary! My full review of the Gayle Bradley 2 to follow. It’s hard to be objective about something you really, really like. The Gayle Bradley Folder is without doubt one of my favorite folding knives, from my favorite knifemakers, which is saying a lot given I’ve been playing obsessively with knives for over 15 years. There are very few things I dislike about it, and the things I do I chalk up to design ethos rather than design failure. I highly recommend you pick one up while they’re still available, or on the secondary market.